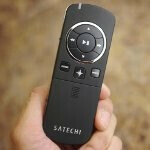 Compared to its predecessor, the Satechi BT Smart Pointer is a bit beefier in terms of size, though, it’s still very compact and lightweight. Actually, the increase in size is a welcome sight, considering that its predecessor came off a little bit on the cheap side with its construction and choice of materials. Again it’s constructed out of mostly plastic, but we do appreciate the subtle new things it’s sporting – like the chrome trim and soft touch finish. However, the control schematics remain relatively unchanged. Specifically, the Satechi BT Smart Pointer features three distinct modes, which can be selected by choosing the correct mode on its right edge. First, there’s the accessibility mode that enables you to use it to browse/open apps and navigate through keynote slides – albeit, you’ll need to enable the VoiceOver feature in the Accessibility settings of an iOS device. Secondly, the multimedia mode turns it into a dedicated media playback control, which allows for pause/play, forward/reverse, and volume adjustment. Finally, the presentation mode allows you to navigate through slides. Additionally, the inclusion of a red laser pointer and rechargeable battery are new things we haven’t seen before, so they’re obviously welcomed too. One of the practical scenarios that the Satechi BT Smart Pointer comes to good use is when we’re taking photos, since we can prop our device on something and take a snapshot from afar with the Satechi BT Smart Pointer. Donning a $44.99 price point, which is $5 more than the starting price of the original model, it makes plenty of sense considering some of the new inclusions coming along with it.